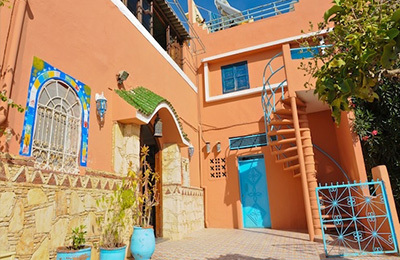 Villa Shangri-La, Surf & Yoga is located close to all Banana village amenities and 4 km from the village of Taghazout. The Devil’s Rock (Imourane), Crocodile and Banana surf spots and beaches are at a 2 km from the surf & yoga Villa. Our team knows better than anyone that the essential ingredients for a successful surf trip are: clean and comfortable accommodation, tasty meals and experienced, friendly and dedicated personnel to make sure everything goes smoothly. The qualified surf instructors will teach and supervise you following strict safety guidelines to ensure that your first wave is unforgettable. Our local surf guide know the surf spots from Imsouane to Mirleft like the back of their hands, and if you are an experienced surfer, they’ll take you to discover them according to the weather and surf conditions. After Surfing during your “free” time you can enjoy yoga class, either in our yoga studio or on the rooftop terrace, sunset horse back riding, traditional Moroccan hammam, argan oil massage, just go in the village for a chill out and coffee or mint tea, go shopping in Agadir souk “El Khad” or in Taghazout, or simply chill by the pool or on the rooftop terrace and read your book!!! We offers a range of packages and retreats, car rental, surf guide hire, day trips (Paradise Valley, essaouira or Marrakech), etc. and special discounts for groups from 5 people! All year round, our team will extend a warm Moroccan welcome and give you the experience of a life time. From beginner to expert level our qualified surf and yoga teachers will give you the very best of what they have to offer! 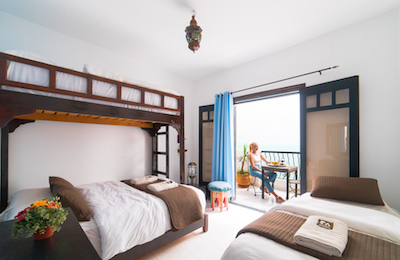 Villa Shangri-La, Surf & Yoga is a Villa style house with 6 rooms, all overlooking the beautiful garden with a swimming pool. There is also large a terrace with stunning mountains and ocean views. All rooms are en-suite, equipped with toilet, shower or bath, hair dryer, and bath towels. You can also enjoy free WIFI throughout the villa and in the garden. * Three meals a day are included in most of our surf & yoga packages. From 8am – Breakfast: hot drinks, fresh orange juice, fresh fruits, cereals, yogurts, etc. Round 9am – Your surf instructors / guides will come to meet you and load up the vehicle with all the surfing gear and picnic lunches, then head out for a surf. The spot will be chosen according to the day condition. Round 1pm – Packed lunch at the beach. After – free surf practice under the supervision and professional advises of our surf instructors. 7.30pm – Dinner time, delicious Moroccan and international food will be served in the patio next to the swimming pool in a chilled and relaxed atmosphere or in the communal lounge. On 7 night packages, there are 6 days activities and they occur on a regular schedule at set times. The are extra activities with extra cost and guests can decide to attend or do extra activities without getting refunded for the activities included in their package if those activities occur at the same time. Surf: all day (morning lesson 2 to 3 hours and afternoon free practice), qualified surf instructors, included in all packages, group lesson 1:8 max, private lesson available on request, language spoken (French, English, Spanish, Arabic), surf equipment (board + wetsuit), transport to the surf spot included in all packages, lessons for all levels, guiding for advanced level, picnic lunch included in most packages, suitable for all ages (min 7 years old), it is compulsory to know how to swim. Yoga: included in the surf & yoga packages, yoga equipment supplied (mats, belts, bricks, bolsters, blankets), qualified and certified yoga teachers (minimum RYT 200 hours), mornings (7 to 8am) and / or afternoons (5 to 6pm). All levels of yogis are welcome! Paradise Valley day trip – 40 € (440 Dh) / pers, including transport and lunch. Experience the sunset on the beach on a ride setting out from Aourir towards Taghazout … An extraordinary and compelling experience. Massage – 20 € (200 Dh). Experience the pleasure of a 1 hour massage with argan oil rich in vitamin E and antioxidants. Traditional Moroccan Hammam – 20 € (200 Dh) per session. This oriental ritual that originates from Roman times is a staple in the lives of Moroccans. The baths are both a social meeting place and a place to relax, enriching both the mind and body: this is an experience you should not miss while you are in Morocco. The hot steam dilates blood vessels and helps the body to relax. Rough skin floats away, toxins are eliminated, muscle pain alleviated and your stress released! Perfect after a day of surfing! The local Agadir, Aourir, Taghazout and Anza souks. Essaouira Medina: formerly known as Mogador (from the Phoenician word Migdol which means “small fortres “), it is an outstanding example of an eighteenth century fortified city, surrounded by Vauban style walls and a UNESCO World Heritage Site. Marrakech: at the foot of the Atlas Mountains, home to impressive architectural masterpieces and Moroccan art (ramparts, monumental gates, the Koutoubia Mosque, Saadian tombs, Badiâ palace ruins, Bahia Palace, Menara pond and pavilion,etc) each one an outstanding example of Moroccan heritage in itself. 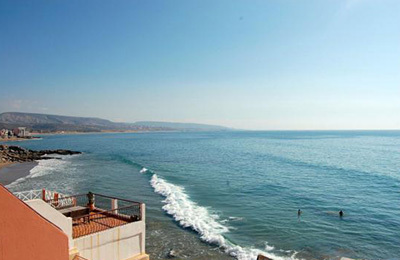 The Agadir area is blessed with a warm to hot climate all year round and the water never gets that cold. The evenings can be chilly in the winter as you are by the ocean. Every day, the surf instructors and surf guides decide, according to weather and surf condition, the best surf spot to go to suit all level of abilities. Each day is based around the surfing conditions and the choice of suitable surf spot according to groups abilities and wants and needs of everyone. We aim into trying to please everybody! From May to September, conditions are less regular and waves more melow, but you can have some very good sessions. In winter, the moderate offshore winds blow N/E giving amazing conditions from October to April. Tides vary between 0.6 to 2 meters and may affect the non-profound water spots. You need a 3/2mm wetsuit from November to April with a water temperature between 16°C and 19°C. From May to October, a swimsuit, a top or a springsuit is more than sufficient. There are about 10 surf spots within a 15 to 20 min drive, and many more within the hour. The 11 and the 12: very nice lefts, tubular during the first section on a rocky flat stone, reef wave feeling when take-off – to surf especially in low, rising tide. Banana: Long right coming from a cliff and ending up on a pebble or sand beach. Devil’s Rock: Small beach isolated between two rock advances. Beachbreak that can almost always be surfed with some very good-quality waves sometimes. Killer Point: a long right on the flat stone working in various size and composed of 3 sections: – the first one, the farther is a large basin- the middle one, much longer than the 1st one is composed of lots of quick sections- the inside, long and hollow, is smaller and steadier. When the swell is quite heavy (1.50m), those sections can be connected and the wave allows a 300m surfing. From this size, the wave current and power become dangerous and require a very technical surfing. Boilers: also known for its sea-urchins, this is a spot that well-receive the swell. Offshore wind, sideshore by a Northern wind, a very good right on the flat stone of the rock. Not many waves, very quickly crowded and can be surfed from low to half-tide. Not easy launching and coming out of the water for those who are not used to rocks, boots are recommended. Reachable for regular level surfing. Dracula: Impressive place, incredible right, probably the most powerful of all, reserved for very good surfers, can handle heavy swells, difficult launching, and uncertain coming out of the water. Tamri: A beachbreak that takes well the swell in little condition days. 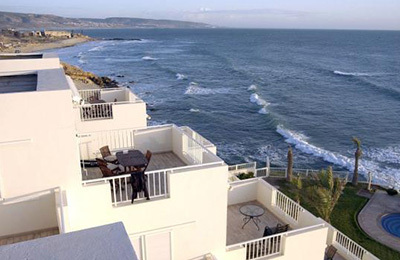 Return Agadir airport and bus station are included in our 7 night packages. Other, please check the various options and rates in the “getting there” section, or contact us. Agadir is the closest and easier international airport for you to get to us. From Essaouira: same kind of trip and cost. If the bus driver is ok with it, you even ask him to drop you off in Tamraght on his way to Agadir. From Marrakech: cost 120 dh each way. From the airport, take a taxi (100 dh each way) to either CTM or SUPRATOURS bus station, then take the bus to Agadir. Total cost one way, round 220 dh. From Agadir: once out of the airport keep heading for Agadir, then follow the signs for Essaouira. Once passed the Agadir port and marina keep heading for Essaouira, it is from there about 15km. You will pass the village of Anza, then Aourir (Banana village). At the roundabout take the first exit on the left, drive for less than 1km, then turn right heading for Imouzzer. An other 1km, and on the right, here we are, Villa Shangri-La. From Marrakech: from the airport, head for the motorway direction Agadir. Once out of the motorway, keep heading for Essaouira. Once passed the Agadir port and marina keep heading for Essaouira, it is from there about 15km. You will pass the village of Anza, then Aourir (Banana village). At the roundabout take the first exit on the left, drive for less than 1km, then turn right heading for Imouzzer. An other 1km, and on the right, here we are, Villa Shangri-La. From Essaouira: drive out of the airport and when you arrive at the main national road, take a left (right is to Essaouira) and follow the direction to Agadir. From there it is about 160km to Tamraght. It is a coastal national road, first in the hills (you’ll pass the villages of Smimou, jonction to Imsouane), then by the ocean (villages of Tamri, Imouadder (Paradis plage), Taghazout, Tamraght). In Tamraght, go straight in the round about, go all the way to the traffic light (on your right, Imourane camp side), go straight until the next roundabout, go left, drive for less than 1km, then turn right heading for Imouzzer. An other 1km, and on the right, here we are, Villa Shangri-La. For those of you who are good or excellent surfers who want expert local knowledge of the best surf spots plus some technical advices, and at the same time use the ease and comfort of our surf & yoga camp our surf guiding package is for you. We recommande our guests to purchase a travel insurance that covers surfing and repatriation. We decline all responsibilities in case of accident or breakage and / or lose of surf equipment.